When Human Resource Background Checks applies for a disclosure from the DBS, the information (which is sensitive) about new and existing employees or volunteers is treated in the strictest confidence. The DBS are committed to ensuring that this information is used and interpreted fairly and their Code of Practice, vetting of Registered Bodies and their assurance procedures are all designed to ensure fair play throughout the whole process. All personnel involved in the application procedure are absolutely committed to processing the information collated in a non-judgemental fashion. Our DBS On-line application service is designed to help companies and organisations to carry out Disclosure checks (DBS Disclosures) and to provide You with up-to-date DBS information in order that You can make informed recruitment decisions based upon the Disclosure and Barring Service checks, (DBS checks), on the suitability of staff and to provide greater protection to children and vulnerable adults. 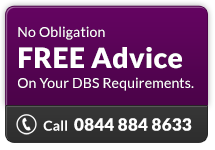 omust have a DBS check? The following professions must have a DBS check carried out.